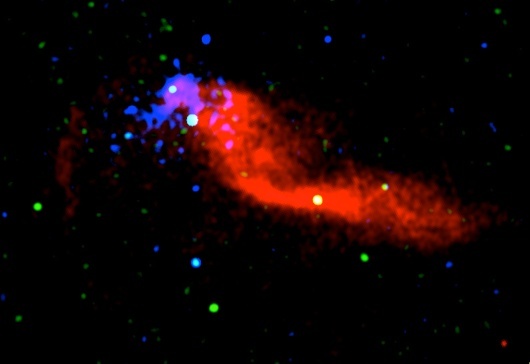 Composite image of the source C region of HESS J1843-033: in red the radio image (from the VLA survey) showing a radio-galaxy candidate and a small fraction of a putative supernova remnant shell at the left, in blue the Chandra image, showing the diffuse emission coincident with the northern lobe, which is likely to be a pulsar wind nebula because of its morphology and spectrum. With increasing statistics of data and improved analysis methods, many of the extended H.E.S.S. gamma ray sources can be resolved into finer structures or even multiple sources. A nice example is a study of the region of Scutum arm tangent. The Scutum arm is one of the spiral arms of our Galaxy, and from the solar system one looks along the tangent of arm, at Galactic Longitude around 30 deg., with sources located along the arm piling up, see Fig. 1 top. 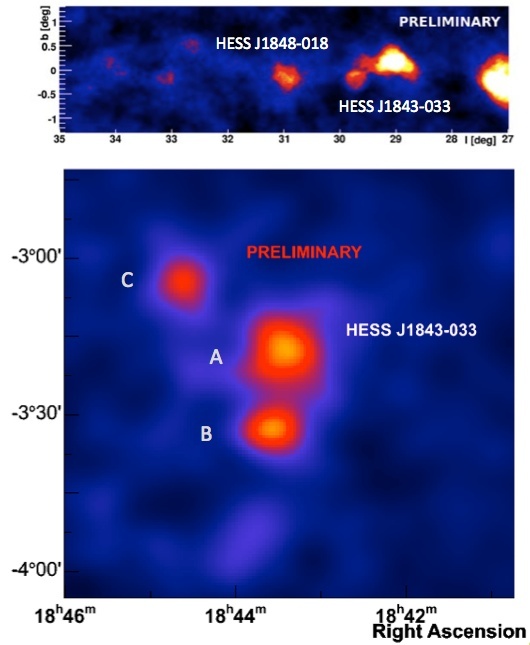 Applying analysis techniques to optimize angular resolution, the extended gamma-ray emission of the source HESS J1843-033 can be resolved into three significant gamma ray sources labeled source A, B, C, see Fig. 1 bottom. Source A is an extended source, source B is consistent with a point source, and source C is marginally extended. Below source B another faint hotspot starts to emerge. Radio- and X-ray images (Fig. 2 and Fig. 3) are used to search for counterparts. VLA radio data (Fig. 2) show that source C is coincident with the elongated radio source PMN J18440306 and the recently discovered SNR G29.37+0.10. PMN J18440306 is considered a background radio galaxy with a dual jet morphology (Helfand et al. 1989). Source B is in complex region with bright nearby star-forming and HII regions. Source A has no radio counterpart inside full extension (large circle). ASCA X-ray data (Fig. 3) show no counterparts for sources A or B, and the source AX J1844.7-0305 coincident with source C. Chandra data (top image) were used to provide a higher-resolution X-ray view of the source C region, and show highly absorbed X-ray non-thermal diffuse emission around a point like source at the top of radio lobe structure. While a hot spot in the lobe of the radio galaxy cannot be excluded as origin of the gamma-ray emission, a pulsar wind nebula possibly connected to the faintly visible radio remnant (top figure) seems more plausible, with a chance overlap with the radio galaxy jets. Fig. 1: Top: The Scutum arm tangent as seen in the H.E.S.S. Galactic Plane Survey (in Galactic coordinates). Bottom: Zoom into the HESS J1843-033 region, using a gamma-ray analysis optimized for best angular resolution, and applying minimal smoothing of the image (image in RA-Dec coordinates, rotated compared to the survey image). The three sources have significances in excess of 8 sigma (source C), and 10 sigma (sources A, B). Source A is extended with a size of 0.15 degr., source B is consistent with a point source, and source C is marginally extended. Fig. 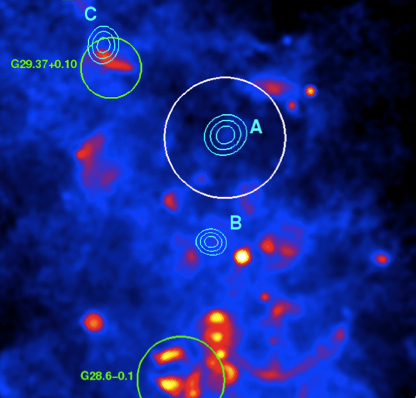 2: Radio image of the region, at 1.4 GHz from the VLA Galactic Plane Survey. The positions of the gamma-ray sources A,B,C are indicated. Also indicated are the supernova remnants G29.37+0.10, overlapping with source C, and G28.6-0.1, coincident with a gamma-ray hotspot marginally visible below source B in Fig. 1. Fig. 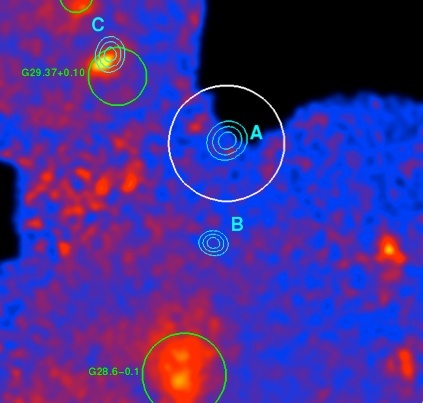 3: X-ray image of the region by ASCA, for the 0.3-12 keV energy range, with gamma-ray sources and remnants indicated as in Fig. 2. The bright X-ray emission near source C is the X-ray source AX J1844.7-0305.